I love summertime in New York City. Relaxing in Central Park, going to outdoor concerts, dining al fresco at street cafes- what’s not to love? But after a long, hot day of enjoying all that the city has to offer, I often find myself craving a refreshing, ice cold drink to quench my thirst. Agua fresca literally meaning “fresh water,” is the perfect thirst quencher. It’s a popular cold drink sold by street vendors and restaurants all over Mexico, Central America and the Caribbean. It’s made of water mixed with seasonal fruit, cereals or seeds. A little sugar and lime juice are usually added to the mix and then it’s refrigerated until it’s ice cold. The consistency is thin, like water infused with fruit, not thick like a smoothie. The great thing about aguas frescas is that you can make so many different varieties- try experimenting with any type of fruit that purees well like melons, pineapple and berries. 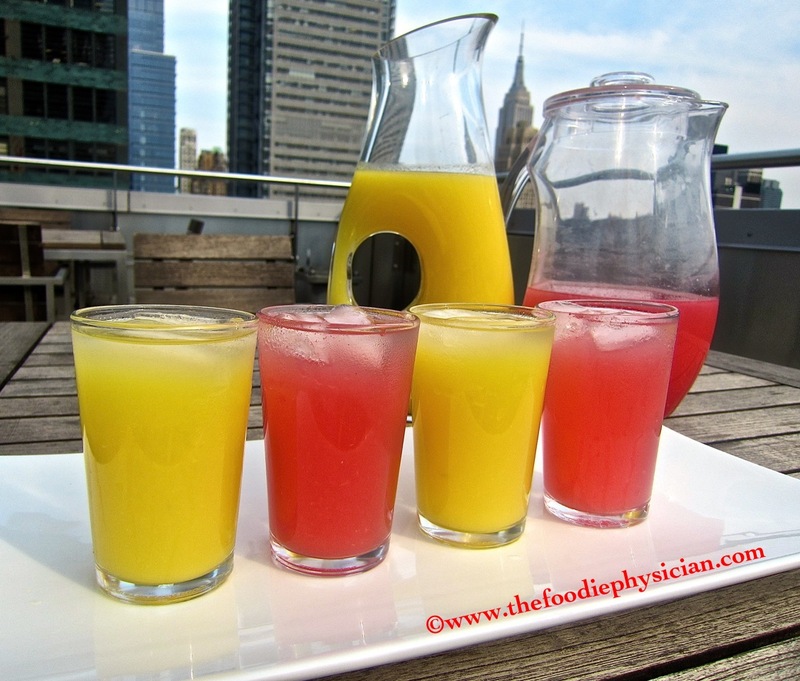 Here are recipes for two of my favorite flavors- mango and watermelon. You’ll notice that the proportions are slightly different because the mango puree is much thicker and requires more water to achieve the right consistency. Although aguas frescas are usually strained to remove any fruit pulp, I skipped this step for the sake of simplicity and I still loved the end result. However, for you purists out there, go ahead and strain the mixture before serving. The amount of sweetener you use will depend on the sweetness of the fruit so start with a little and add more to taste. I prefer mine with only a small amount of sweetener so that the natural flavor of the fruit can shine through. Try serving your favorite agua fresca at your next party- you can even spike it with a little vodka or champagne for an adult version. Or keep a pitcher of it in the fridge so that you’ll have a nutritious and refreshing thirst quencher anytime you want it. It’s the perfect antidote for the summer heat! Place the mango in a blender with 1 cup water, honey and lime juice. Puree until smooth. Pour the mixture into a pitcher and add the remaining 5 cups water. Stir to combine. Refrigerate until cold. Serve over ice. Place the watermelon in a blender with 1 cup water, honey and lime juice. Puree until smooth. Pour the mixture into a pitcher and add the remaining 3 cups water. Stir to combine. Refrigerate until cold. Serve over ice. What’s your favorite summertime beverage? Leave a comment and let me know! Thanks, Terra! They are really easy to make and the natural colors of the fruit are beautiful. Love these, Sonali. Both flavors look sweet, delicious and just plain pretty! Yes, perfect for this summer heat. Thanks, Katherine! Sounds perfect for the heat – especially with champagne. What a fabulous post Amee!! You made me so nostalgic! In fact this is how we make 'sherbet'…..not the frozen ones, the drinks. In every Indian house, these homemade sherbets are served to guests during summer. Oops! I thought this was Amee's post…..clicked through her FB page. But glad I did……you have a lovely blog. Hi Sonali! I'm sharing this on my Syrup and Biscuits FB page! I love the mango. I bet it would be great with a little seltzer water. I love fizz! I do too! 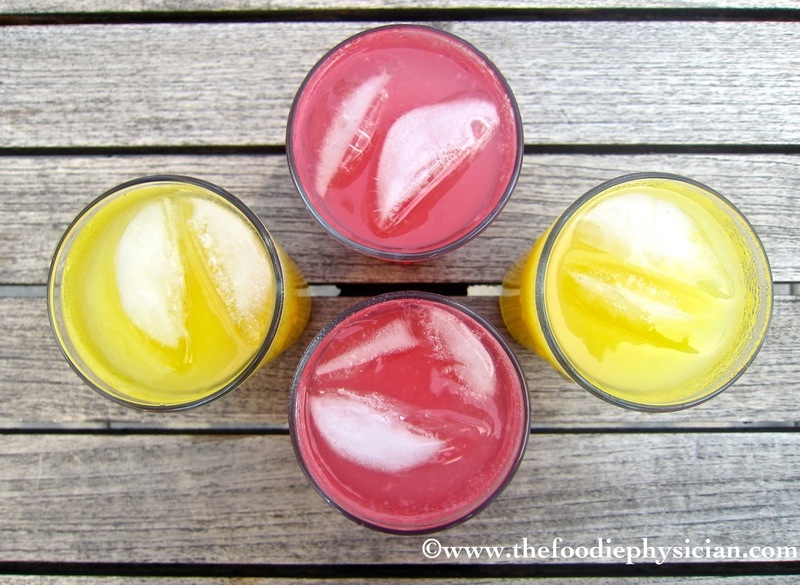 I often mix fruit purees with seltzer to make a healthy, homemade soda! I am always looking for delicious alternatives to straigh water and these look amazing! Oh my gosh, this is so refreshing and delicious!! 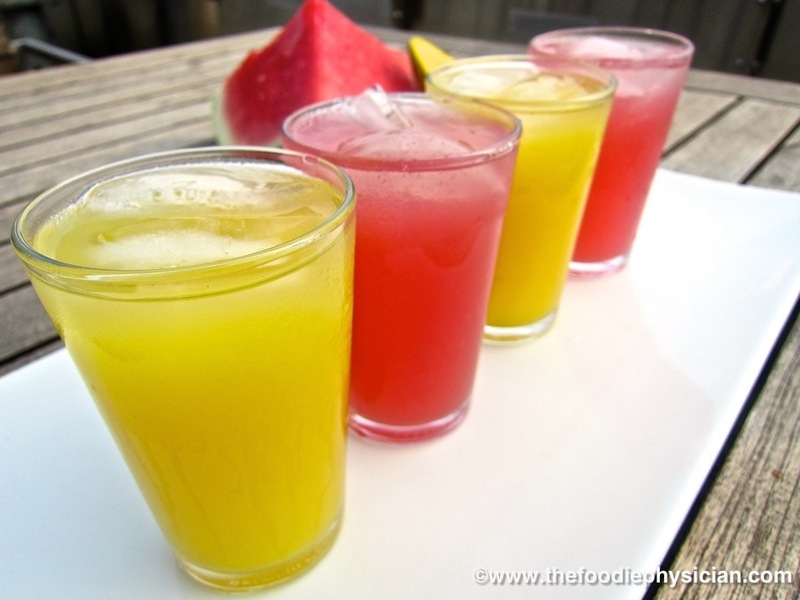 I love these fresh fruit drinks! Thank you for sharing! 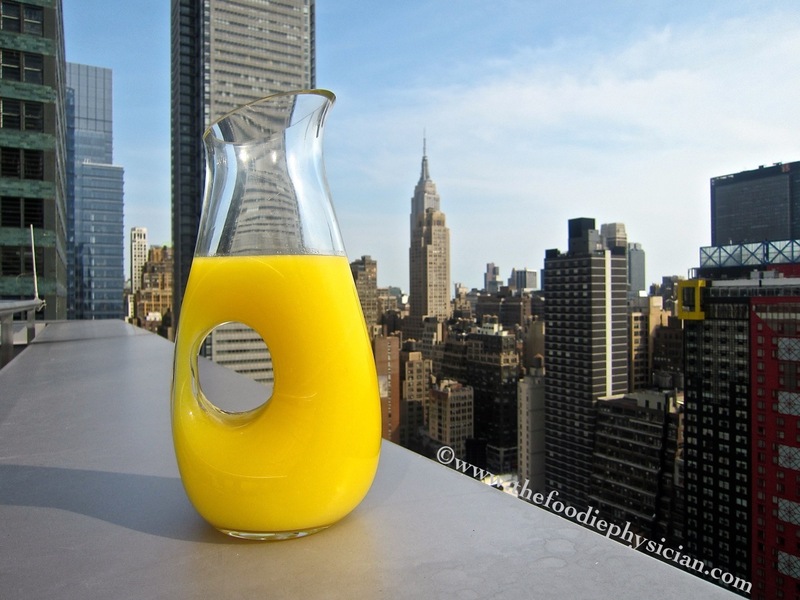 Hello fellow NY'er…I love this nice simple recipe for fruit water! I'll have to try it sometime! Thanks for sharing! 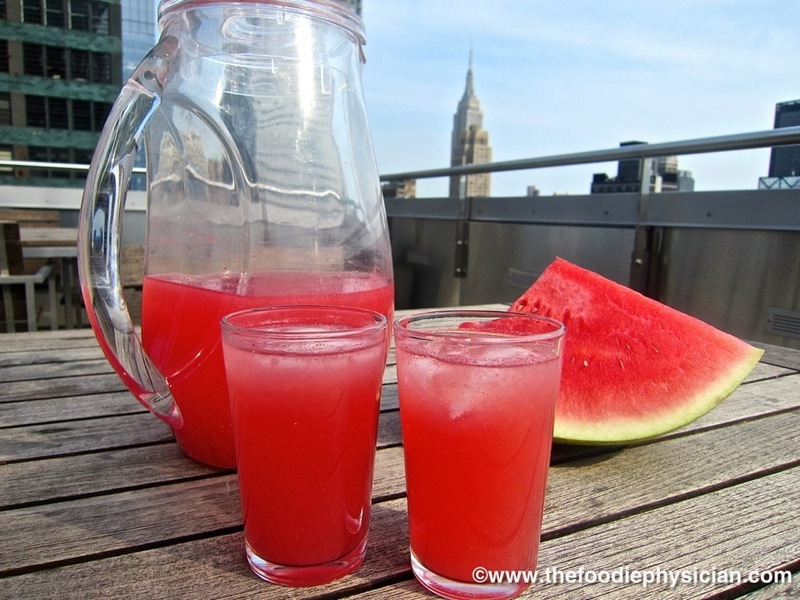 I have tried the agua fresca with left over watermelon,. tastes delicious even with the pulp. I like the feel of the pulp in my mouth. I have cans of mango puree and I will try with that too.